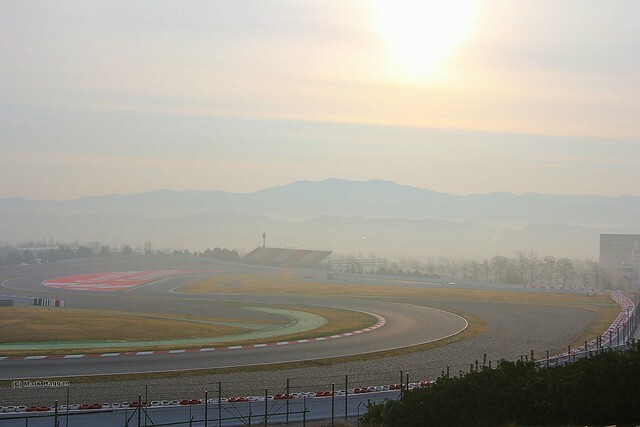 It’s January 2013, and although there is snow on the ground at home in the UK, it is almost time for an escape to the (hopeful) sunshine of Barcelona and Formula One Winter Testing. 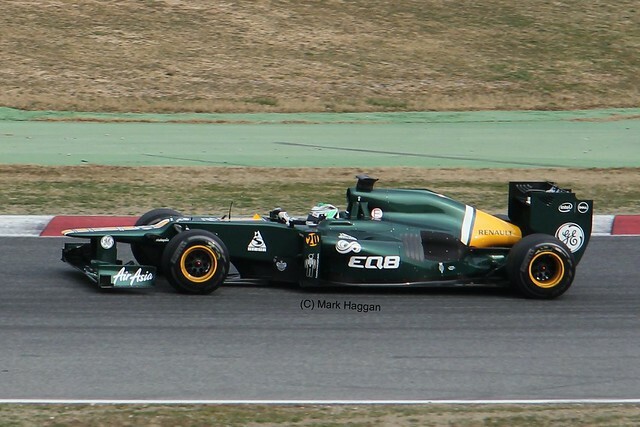 I wrote an article for Fan Formula after last year’s event, Formula One Winter Testing 2012. 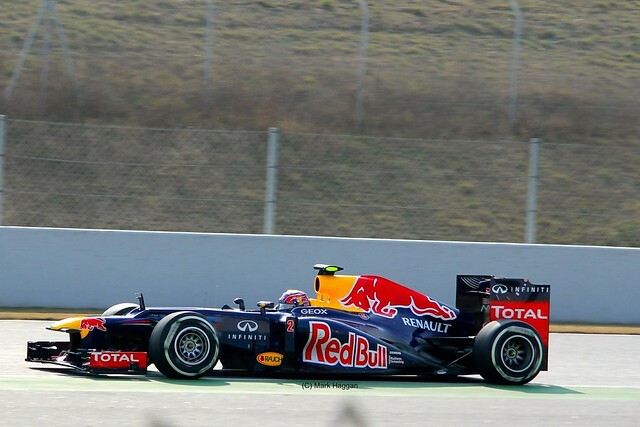 Each year, Formula One teams have a series of test days where they can put their new cars through their paces in advance of the first Grand Prix of the season, and this year, the tests were in Spain, finishing with a four day test at the Circuit de Catalunya near Barcelona. These events are open to the public, but this does not appear to be widely known, and attendance is relatively small. This gives a great opportunity to get close to the action. There is a real buzz of excitement as attendees get that feeling that they are getting a sneak preview not just of the new season, but also of the new cars. 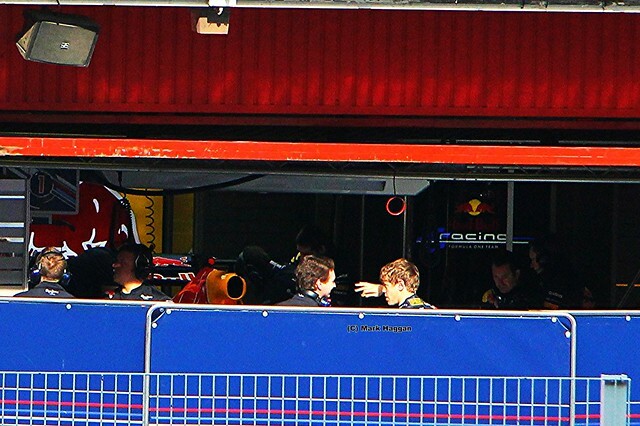 The teams are, of course, keen not to give away too many of their secrets in advance of the season, hence why Red Bull went to all this effort to keep the back of Sebastian Vettel’s car out of view this year. 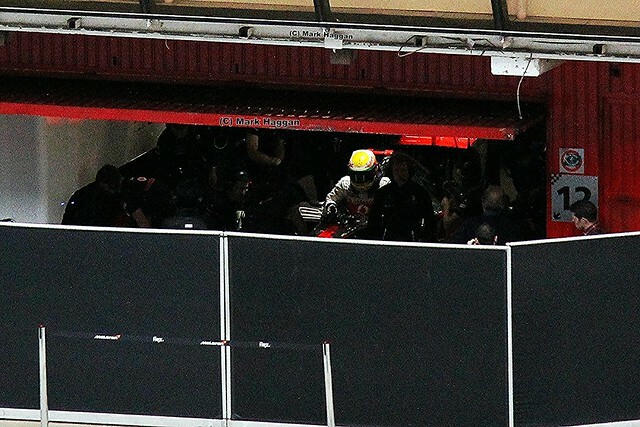 As you can tell by the video (below), as a fan with a general admission ticket, you can get some great views at testing that many people would not see at a Grand Prix. If you are like me, then the winter period with no Grands Prix to watch either live or on television is a fallow period in the sporting calendar, and come the beginning of each New Year, I am already excited about the impending new Formula One season. Teams soon launch their new cars, and I am eager to see them and what has changed since the previous year. I already have tickets for the British Grand Prix this year, and was considering which other races, if any, to attend. This trip allowed me to get back into the excitement of the sport before the season even started. I went with a friend, and we enjoyed it so much that we are currently planning a trip to the European Grand Prix in addition to the forthcoming Silverstone race weekend! Winter testing is a great opportunity to see the cars first hand, and witness the speed, sound and excitement of Formula One cars ahead of the start of the season. The sight and sound like that of Hamilton and Raikkonen racing down the main straight is something very special. At most Grands Prix, the longest session that you will see cars continuously circulating around the track is the actual race, with a maximum time of two hours. At testing, there is a four hour morning session, a one hour break, and a three hour afternoon session. Seven hours of watching Formula One cars makes any day exciting! As already mentioned, attendance is relatively low at testing, and hence the session is normally open with access available to all of the grandstands, allowing you to get a good view of the action from various parts of the track. 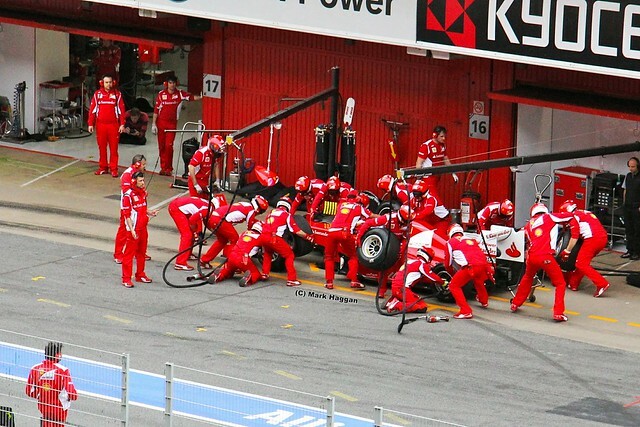 The teams practiced pit stops, tried out various wings and other combinations, race simulations, and all sorts of other set ups throughout the weekend, which was exciting to watch, including cars with odd attachments like the famous Ferrari telescope that no doubt were being used for some type of investigation. necessary to have an enjoyable visit. We bumped into the HRT team back at our hotel, who unfortunately had not been able to test their car. It was still a nice surprise for us to come for breakfast each morning to be surrounded by those in full racing team outfits, even if they did look a little despondent each night in the bar! The hotel was occupied by us, the HRT team, some Formula One journalists of varying nationalities, and bizarrely, a US girls’college soccer team on tour! Although we did not end up meeting any of the drivers or designers, we did see Adrian Newey on a trip around the circuit, and we met other people who had a series of relatively close encounters with the stars of Formula One. Wonderfully, access to Testing can be a relatively low cost affair. We paid about £100 each for flights from London to Barcelona, £42 per room per night for a four star hotel near the circuit, and €20 per day for tickets to Testing. The cost is for testing is only €15 per day on the less busy Thursday and Friday tests. Our biggest extravagance was the use of taxis. We took a cab from the airport to the hotel, and each day to the circuit and back. Even though we were only a few miles from the track, taxis cost between €30-€40 per journey. The very helpful staff at the track called us a cab to get us back to the hotel after testing; we were not sure what time we would want to leave so did not book a car in advance. If cost is a limiting factor, then hiring a car would be a much more cost effective option, and if you do stay in a hotel nearby, then the relatively quiet and large roads around the circuit make it an easy drive. There is also ample parking at the circuit. There are at least three other ways of getting to testing. Firstly, some tour companies offer complete packages. Of course, there is an uplift in cost for that, but it takes away any of the hassle of trying to organise the trip yourself. You can also buy hospitality packages with some of the teams, giving you access to the relevant team and the drivers there. Typically, this costs in the region of £500 for a day, which although it may sound expensive, is still significantly less than, say, a ticket for the Paddock Club at most Grands Prix. 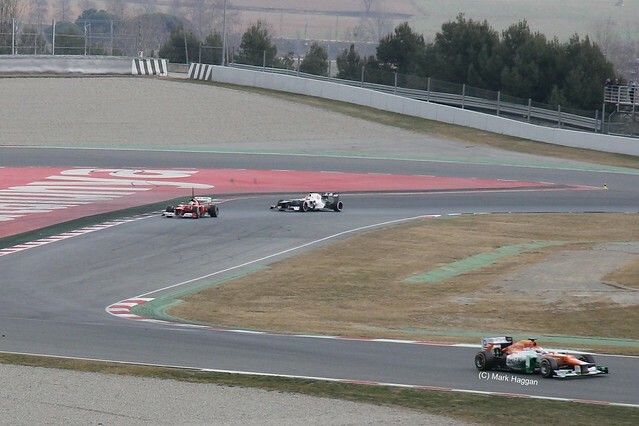 Finally, this year, those with three day tickets to the Spanish Grand Prix at the same circuit later in the year get free access to the testing, including a pit lane tour and a loop of the circuit in a bus. We did meet one fellow Britain who ascertained that the cheapest Grand Prix ticket that would give her access for four days of testing was slightly less than the €70 for four days testing, and went for that option, hoping to make it back for the race! We stayed until Monday evening, which gave us a free day to explore Barcelona. Although we were staying in the Barbera del Valles district between the city and the circuit, a €10 taxi took us to the station where a couple of euros took us to the centre of Barcelona for the day. We had a wonderful time. 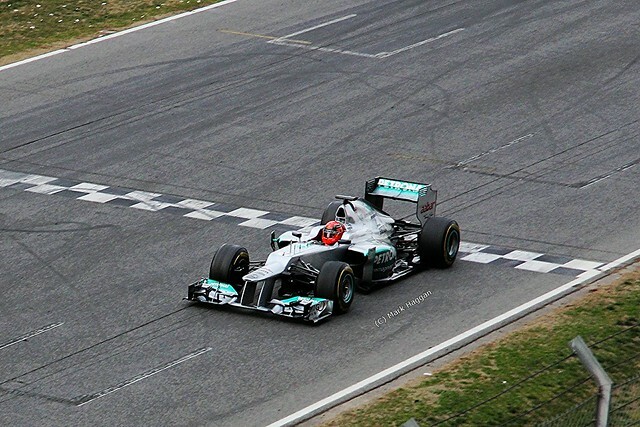 I was re-enthused about Formula One racing, and even more excited about the new season. 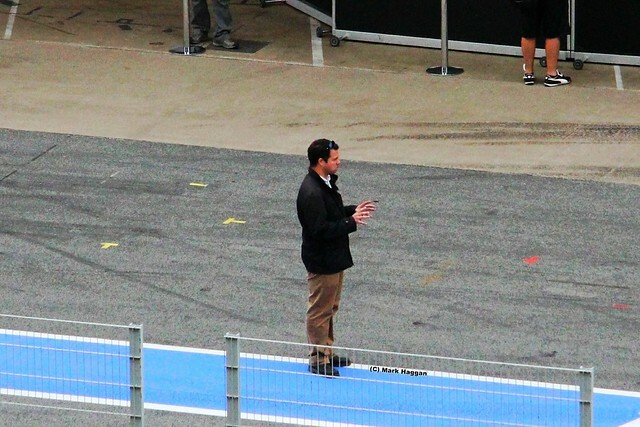 It was my first time to the Circuit de Catalunya, and I was very impressed at the track. It was reminiscent of Donington Park or Sepang, where there are large sections of the circuit from where you can see action right around the venue. The relatively low attendance – most of the grandstands had an occupancy of at best a handful of people, other than the main grandstand which was still very, very far from full – made it really easy to stand where you wanted and to get a really good view without other people being in the way or having taken all the best spots. Sunday was much busier than Saturday, as local hero Fernando Alonso was testing that day, but it was nowhere near as busy as even a Friday practice day at an actual Grand Prix. 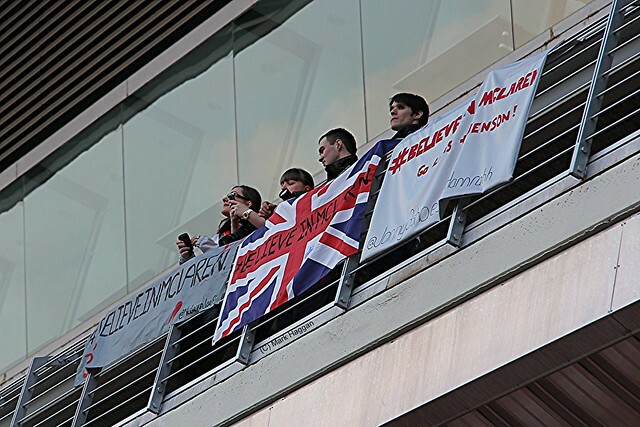 Although the majority of the attendees there were Spanish, there was a significant and visible British minority, and it was a friendly event where it was easy to stop and talk to other Formula one fans. I would jump at the chance to go again next year, and am very hopeful for another European Winter test! 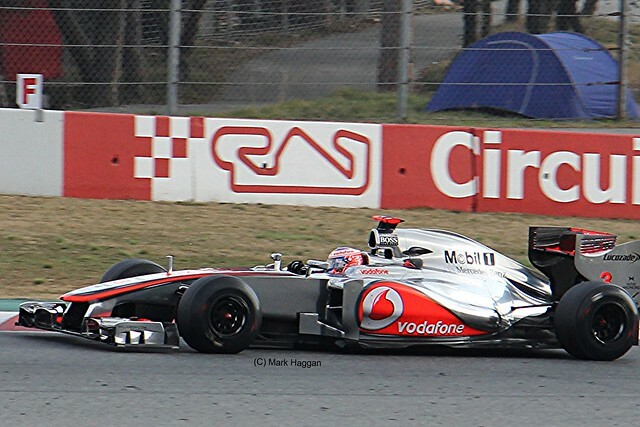 Europe, Formula One, Motor Racing, Travel Barcelona, Circuit de Catalunya, F1, Formula One, Motor Racing, Winter Testing. permalink.